UCSB's Associated Students Program Board presents The Sounds in concert this Monday night at the Hub. Back in 2003, on the brink of the synth rock explosion, Sweden’s The Sounds became an underground success story of sorts. Thanks to a whole lot of touring and some very famous fans (Dave Grohl, Bam Margera, and Quentin Tarantino, to name a few), the band’s debut release, Living in America, hit number four in Sweden and scored the group some highly coveted opening slots for bands like The Strokes and Foo Fighters. Since then, the New Wave craze has come and gone, and The Sounds, now with three albums under their belt, are still going strong. Most recently, the band (made up of lead singer Maja Ivarrson, guitarist Felix Rodriguez, bassist Johan Bengtsson, pianist Jesper Anderberg, and drummer Fredric Nilsson) wrapped up a continent-spanning tour with No Doubt, which included a memorably sexed-up set at the S.B. Bowl in August. This week, The Sounds return to Santa Barbara for a headlining show at UCSB in support of their recent, independently released full-length, Crossing the Rubicon. I recently caught up with Rodriguez to discuss the band’s new label, devout fans, and love of college parties. You guys recorded and released your new record on your own. Why the decision to ditch the label? Well, we didn’t want to release it with the people we had been working with before. We wanted also to have more creative control and be more of a part of it than we had in the past, so we decided to break free and do it ourselves. We started a crazy little record label and can license whoever wants to work with us. It’s been pretty interesting. You basically do it yourself with a little help from other people around you. This album also took a lot less time to make than 2006’s Dying to Say This to You. The whole process of writing the album and recording it and releasing it took one year. You don’t think about labels or who’s going to put it out when you write songs because you write music for yourself, not for anyone else. When we were writing this album, toward the end, we were a little bit anxious because we didn’t know when the album was going to come out or how we were going to release it. It was a bit difficult because we didn’t know how or when or who, what kind of people we were going to work with. But the writing process just comes natural. Sometimes it goes pretty quick, sometimes it takes longer. It depends, I guess, how inspired you are. So what inspired most of Crossing the Rubicon? We were stuck, and we had to choose where we were going with our careers. It’s about that. When you reach a level in your career when you have to think, ‘Are we happy with how we were working before?’ ‘Can we make some changes to what we’re going to do?’ ‘Are we going to take it to the left side or to the right side?’ That’s what Crossing the Rubicon means to us. Once you make that decision, there’s no turning back; you just have to go with it. What’s the secret to your longevity? First of all, you have to be good friends. If you have good friends you can work things out. We’ve grown with each other, and we have respect for each other, so as a band, we work together really well. Of course you have to keep writing good songs to keep your band alive, but what drives you is the fans. The fans make you want to come out and play more music. If we didn’t have devoted fans, which we have, we couldn’t keep going. It’s thanks to them that we’re still a band. If they didn’t appreciate what we were doing, we couldn’t play for anyone, you know? I guess it’s fans and band together that make it last. Have fun, be good friends, and be who you are. Your show up here is the only college stop on this tour. How do you feel about playing universities? I don’t know if we’ve done many university shows before. It’s going to be awesome. Most of the people going to college want to have a good time, and if they want to have an even better time at college they should go to our concert. [Laughs.] We love to have a good time, and I know people in college-I’ve been to college parties. It’s a good combo. And funny college party anecdotes to share? I remember one time in San Francisco we went to a sorority house. Is that what you call it? It was so fucked up. We loved it. People were running around, drinking beer, doing beer bongs. There were people throwing fire outside of their house, like juggling with fireballs. Crazy! And then there were all the college guys, the sports guys who were looking at us like we were weird, but they loved us because we were outsiders. They loved our accents and that we were from Sweden. [Laughs.] We learned college can have a bad impact on you. 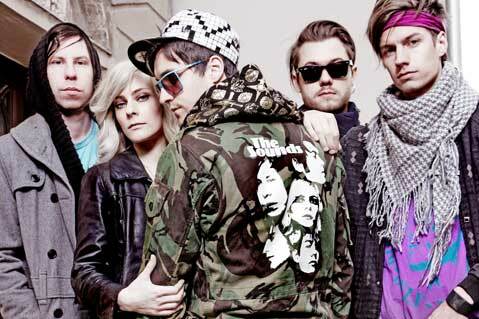 The Sounds play UCSB’s Hub this Monday, October 19, at 8:30 p.m. with openers Foxy Shazam. For tickets and info, call 893-3536 or visit asprogramboard.com.